One of the biggest holiday events in Southern California is CHILL, held each year at the Queen Mary in Long Beach, California. We went this past weekend to check it out, and although Mother Nature decided it was time for some much-needed rain here in the Southland, we had a really fun time exploring everything offered at this year’s CHILL. The popular winter event takes place just off the ship, including the massive dome where Howard Hughes’ Spruce Goose used to reside. In years past, the largest component of CHILL was its Ice Kingdom attraction – a collection of very impressive ice sculptures, including a reproduction of the Queen Mary’s bow and several ice slides for guests to enjoy. The ice sculptures were featured at the event for the past 4 years, and so, management decided it was time to change things up – if guests are coming back each Christmas season to enjoy CHILL, it’s got to be kept fresh and evolving, otherwise interest will begin to fade. 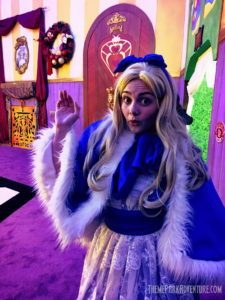 Change things up is exactly what they’ve done this year with the introduction of Alice in Winterland, a large-scale walk-through interactive attraction developed for Queen Mary by Mycotoo, a creative design firm in Los Angeles. TPAers may recall that Mycotoo also developed this year’s new maze, Aftermath 2: Chaos Rising, for Six Flags Magic Mountain’s Fright Fest. 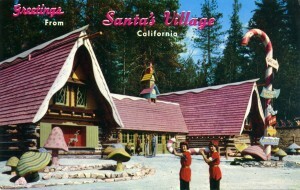 It’s been a long time coming, but it appears that Santa’s Village in the San Bernardino National Forest finally has an opening date – December 2, 2016. When it was first announced that the beloved old theme park in Skyforest had been bought by businessman/realtor Bill Johnson in 2014, fans everywhere became very excited; rightfully so. After closing its gates in 1998, the defunct Christmas-themed park sat abandoned and neglected for years, its wonderful old rides and whimsical buildings falling into a sad state of disrepair and ruin. Vandals left their mark on the closed park, as did the harsh seasons on the mountain just miles from Lake Arrowhead. Over the years, occasional interest was sparked by news of a potential buyer – but nothing ever came of it. When the property was purchased by Johnson, that was a huge step in the right direction, giving us all hope that the little theme park might be restored and returned to operation with a lot of love and a truckload of investment money. The price tag in 2014 for Santa’s Village was reported to be in the neighborhood of $5-6 million. When the 154-acre property was purchased, we cautioned strongly beginning with our May 15, 2014 story about the park possibly re-opening that it would require a lot more than that to get the property back up to modern codes, rebuild its infrastructure, add new attractions, and hire a year-round team, along with seasonal employees. For the past 26 years, Halloween fans have flocked to Rotten Apple 907 in Burbank, California, to visit one of the most elaborate home haunts in Southern California. 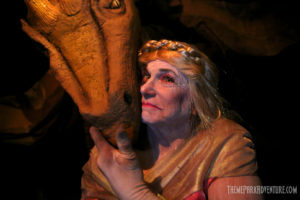 This year, the Rotten Apple team put its twisted spin on popular childhood tales, creating the Not So Enchanted Forest. Entering the foreboding Not So Enchanted Forest through a storybook facade, guests stepped into a dark, heavily-landscaped woodland. A small footbridge carried folks over a babbling brook toward a small cottage in a clearing – but not before a spooky tree a la Snow White’s Scary Adventures or even the Haunted Mansion advanced menacingly! This set the stage perfectly for the family-friendly frights that waited ahead in the darkness of the Not So Enchanted Forest. Once again, Knott’s Berry Farm is offering free admission to the park for active fire and law enforcement personnel from November 28 to December 16, and then again from January 9 to January 31 as part of its annual Fire and Law Tribute Days promotion. 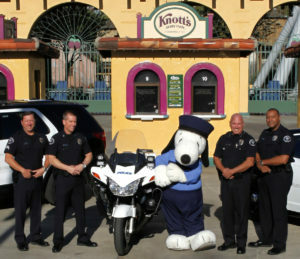 As a way of saying “thank you”, Knott’s Berry Farm extends this offer for free admission to active members of fire and law enforcement agencies plus one guest per valid ID. Branches included in this offer are: ATF Agents, Bailiffs, California Dept. Of Forestry, California Highway Patrol Officers, City, County, State and Federal Police (sworn officers and civilian employees/support staff), City, County, State and Federal Fire (sworn officers and civilian employees/ support staff), Correctional Officers, County Sheriff Officers, Ambulance Company Emergency Medical Techs, Department of the Youth Authority, District Attorneys, FBI Agents, Homeland Security, Police Explorers, Peace Officers, Probation Officers, Reserve/volunteer Fire/Law employees, Sherriffs, U.S. Forest Service Personnel, U.S. Marshals, and Wildland Firefighters. Today, Universal Orlando Resort released new Volcano Bay details that provide great insight to what guests can look forward to when the water park opens in early summer 2017. 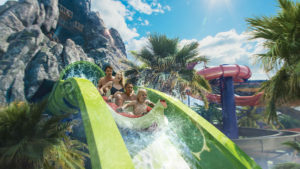 Volcano Bay – Universal’s third park in Orlando – will be themed as a tropical paradise, with sandy beaches, lush vegetation, carved stone tikis, and water-based adventures for the entire family. The park’s icon is Krakatau, a 200-foot-tall volcano, which will steam and smoke throughout the day. After dark, Krakatau’s caldera will glow brightly as lava erupts skyward into the night sky. The park’s featured ride (I personally have a hard time calling water slides “rides”) will be a thrilling attraction called Krakatau Aqua Coaster. This slide will propel guests riding in unique canoe-like vehicles through the dark caves and mysterious interior spaces of the park’s volcano; the vehicles will have the ability to race uphill as well, thanks to linear induction motor technology. Aqua Coasters are becoming fairly commonplace, popping up at water parks and on cruise ships with increasing frequency. What will likely stand out here, is the level of theming and experiential detail that Universal is no doubt, lavishing on this attraction.